Qmobile E770 stylish Bar Phone with Facebook chat enabled mode you can use internet on this low price phone save up-to 500 phone-book entries listen music use dual-sim with long-time battery plus Samrt Camera. 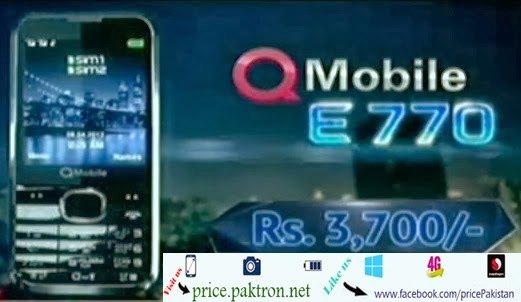 Qmobile E770 have 2.6-inches screen covered in a square for storage microSD card (supports up to 32GB) connect with friends through Bluetooth, GPRS, EDGE, smart camera. Enjoy some extra features Dual SIM, Tourch light, Calendar, Speakerphone listen music anytime on FM Radio, Music Player playing games.